When I went to dinner last week at the relocated BOA Steakhouse on Sunset, I was expecting to get a table inside to immerse myself in the vibrant décor of the room and the bar. Partner-owner Lee Maen kindly showed me the way to the patio. And yes, he was right: that is the place to be. It is one of the largest restaurant patios in town (except for maybe those in some hotels), and a hip, ritzy, glitzy clientele has already made it one of heir favorite spots for lunch, dinner or drinks. 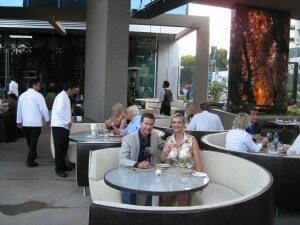 BOA Steakhouse is our Los Angeles Restaurant Review of the Week.